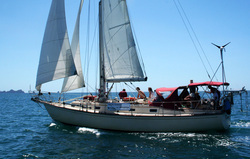 Kingfisher Yacht Charters NZ - Come sail the Bay of Islands! Sail the Bay of Islands with us, Kingfisher Yacht Charters, in Northland, New Zealand. We will take you on a cruise where you will explore the beautiful bays and sights it has to offer. Feel the gentle breeze in your hair and the warm sun on your back and see your cares slip away as our beautiful yacht glides smoothly through the clear, clean waters of the Bay. Our sailing charters specialise in small groups, families and exclusive charters to provide that special personal touch – we want you to feel it is your boat for the day. There are hundreds of beaches and bays to explore. We will give you an experience that you will savor for the rest of your life. Kingfisher Yacht Charters from Stephen Western on Vimeo. Relax in the knowledge that you are in safe hands. We are both very experienced sailors, Stephen - your skipper has been on the water all his life and has spent many years sailing his favourite cruising grounds in the Bay Of Islands, the jewel in the crown of the North Island. Stephen has sailed Kingfisher to the South Islands' Marlborough Sounds and back via the West Coast of the North Island, and has also crewed on other yachts in trips to Tonga, Fiji and on our other charter yacht Kama Lua from Tasmania in the South of Australia to Bluff at the bottom of the South Island. Sue also has a long history of sailing and has experience as a waterwise instructor, teaching many 10-11 year olds the rudimentary basics of sailing in small craft. So come sail with us in paradise and take advantage of our extensive knowledge of the beautiful Bay of Islands setting out from romantic Russell, one of New Zealand’s most historic settlements. You can find us at Russell Pier or just ask at the Russell or Paihia Tourist information centers or Phone +64 (0) 9 4038845 or email info@kingfishercharters.co.nz to book.